This entry was posted in Research on November 20, 2015 by shell_the_admin. In most circles of the population, drones, or (if we want to give them their official name) unmanned aerial vehicles (UAVs) are generally known for their use in military activities overseas, and hence are associated with war and destruction. Having recently been drawn into the world of drones through my work in tropical disease research, I thought it might be worth writing a little something to show how they can be viewed in a more positive light. Many of the technologies we use today were created with a military purpose. A great example of this is GPS. We now very much take for granted the ability to know exactly where we are in the world, and more usefully how to navigate from one part of the world to another, just by pressing a few buttons on our phone. However, the US Department of Defence didn’t spend billions of dollars launching satellites into orbit just so we could work out where the nearest takeaway is. No, it was initially designed so that they could more accurately target their missiles, and its myriad of uses today are a very happy bi-product! The potential uses for drones outside of a military context are starting to be recognised, and we already have numerous examples of their more positive uses, several of which I summarise below. As my interests lie in health, I’m going to focus on the health/humanitarian aspects of drone usage, although they are certainly not limited to these! 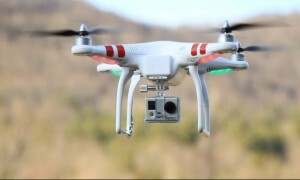 Drones can be used to survey unreachable areas. They were used extensively during the Nepal earthquake response by organisations such as Global Medic (right image). Whilst planes and helicopters are well-used eyes in the sky, drones have the ability to get much closer to the action (and are much cheaper to use). This was demonstrated during the recent earthquakes in Nepal, where they were not only to take impressive, emotive photographs of the affected areas, but were considered vital tools in assessing the damage inflicted on remote communities. Going further than that, as well as identifying areas where help is needed, drones have the potential to play a role in physically delivering essential medical supplies to remote/inaccessible areas. This is the application most closely related to what I do day-to-day. The cameras on drones not only have the ability to take detailed photographs of the landscape but, given the right sort of camera and additional software, can provide much more detailed information about the environmental landscape. We can use this information to identify areas where the risk of certain diseases e.g. those that are transmitted by insect bites (known as vector-borne diseases), is likely to be high. Malaria for example is transmitted by mosquitoes. The very high resolution images captured by drones can be used to identify geographical areas where humans are most likely to come into contact with these mosquitoes, and hence are at greater risk of malaria.This information can then be used to target health interventions, such as the distribution of mosquito nets or the spraying of insecticide. Beyond identifying areas where health interventions are needed, drones actually have the capacity to deliver those interventions. 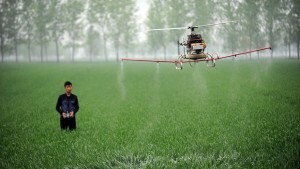 One area where drones are being increasingly used is in agriculture, where amongst other things they’re being used to spray crops. Similar technology could be used to distribute insecticide in areas of high disease risk, thus killing off the disease-transmitting insects (i.e. the vectors) before they have the opportunity to infect anyone. My final example sounds a little more far-fetched than the others, but shows signs of promise. As well as surveying the landscape to know where vectors are likely to be, another crucial piece of information to know is whether the vectors carry the pathogen that causes the disease, and hence have the capacity to transmit it. If they don’t carry it, then there’s no risk of disease and hence health interventions aren’t needed. So, Microsoft are in the process of developing Project Premonition, a system that will include a drone that will not only fly around capturing mosquitoes, but will also analyse these mosquitoes to see if they pose any health risk. Current approaches involve setting traps on the ground, and taking the mosquitoes to a lab to analyse, so if Microsoft can pull this off, this could be a big game changer in the world of disease surveillance. Microsoft’s Project Premonition aims to use mosquitoes, drones and cloud computing to prevent disease outbreaks. The prototype of the mosquito trap they are developing is shown in the right. It’s a weird and wonderful world we live in, and it’s important to remember that it’s always going to be possible to use technology for both good and evil, so let’s stay positive and focus on the good!